After a weeklong heat wave, temps should break heading into the weekend but not before storms move through. Thursday was the seventh consecutive and final day of our first heat wave of 2018. Temperatures in the afternoon climbed into the lower 90s, but feels like temperatures soared to between 95 to 100. Isolated heavy thunderstorms will form, especially inland from the shore, but shouldn’t be as widespread in coverage as the past few days. Any thunderstorm that does manage to develop will be capable of producing torrential downpours and intense cloud to ground lightning. It may be the final day of the heat wave, but people may still be at risk of heat-related diseases. Several types of medication may make people more susceptible to heat exhaustion. Friday will be hazy, very warm, and muggy. Expect two rounds of thunderstorms. The morning round of showers and thunderstorms will impact areas of the Lehigh Valley, northern & western suburbs and Philadelphia. Intense downpours and lightning strikes are the biggest threats with any storms that do develop. A second round of heavy thunderstorms will develop during the afternoon and early evening hours. Areas in Delaware, South Jersey and the Jersey shore will see these storms that will have strong, gusty winds and blinding downpours. Most of the storms will be offshore by 8 p.m. Highs Friday will reach the middle 80s in Philadelphia, breaking our current heat wave. Even though Friday is cooler, there isn’t much relief as humidity levels remain high. Humidity levels will plunge Friday night! That sets us up for a gorgeous weekend across the entire region when true relief arrives. Expect deep blue skies, pleasantly warm temperatures and highs in the lower to middle 80s. The weather will be ideal for outdoor plans both day and night. 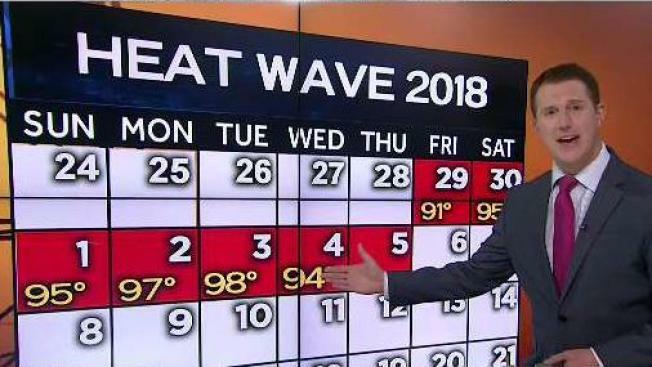 There are signs another heat wave may impact the area next week, so enjoy the wonderful weekend weather while it lasts and stick with the NBC10 First Alert Weather Team for the latest forecast.